Wonder what it takes to complete a dream home renovation? Whether you're planning a project yourself or simply admire those who've undertaken major house transformations, you're sure to find inspiration with Vanessa and Andrew's Lake District renovation. Find out how they did it, then browse more of our real home transformations. Find out how to renovate a house in our step by step guide, too. Vanessa and Andrew have been visiting the Lake District since their children were young, and like so many others couldn’t keep away, as Vanessa explains, ‘We bought our first house in Rydal, near Ambleside, in 2009 and were looking for an old farmhouse in an isolated location. 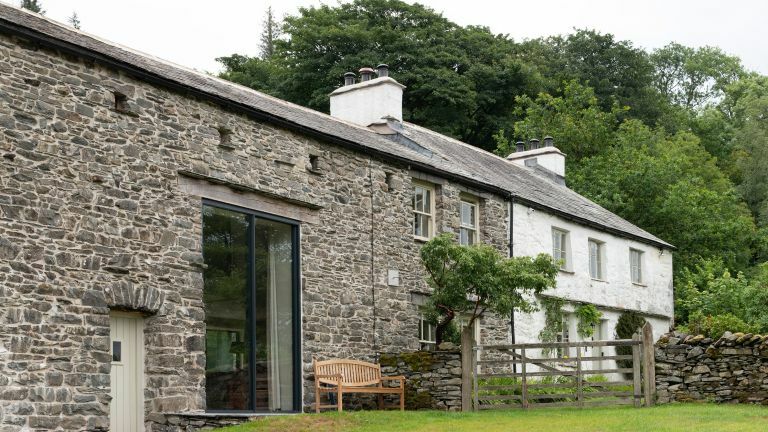 When we found this Kentmere long house for sale in 2015 we nearly jumped for joy.’ They found a buyer for their Rydal house, and embarked on what turned out to be a huge project. Their conservation story started with a trip to the Homebuilding & Renovating Show in 2015. ‘An architect there gave us the idea for a gallery in the barn living room leading to one of the bedrooms, and Douglas Kent from the Society for the Protection of Ancient Buildings (SPAB) guided us in terms of methods and materials,’ says Andrew. Back in Kentmere, they enlisted a local specialist conservation architect to help with the design, planning and ongoing build. ‘Our aim was to restore as many of the original features as possible and our neighbour, a retired architect, was a great help with this, even giving us some old photos of the house,’ says Andrew. Work began as soon as planning permission was granted and the first job was to restore the barn. The couple stripped it back, removing the ugly breeze blocks that had been added in the 1980s and using a traditional lime mortar for the outside walls to allow them to breathe. A modern chimney was removed and the roof was repaired with slate. They used lime plaster on the inside walls and partitions to match most of the original long house. Vanessa and Andrew created a spacious new kitchen-diner from three rooms: a small study to the front of the house and then a side passageway, which had the boiler room leading off it and a downstairs bathroom. The couple exposed the original beams and added this central supporting pillar, reclaimed from their previous Rydal property. Planning restraints meant that the couple had to keep the main elevation of the barn as it was, with no new doorways or windows. The new windows at the back and side of the barn were matched to the original door openings with riven stone slab lintels, hardwood frame and small panes. Down a long winding road that opens up into a stunning valley, you turn right and come upon Vanessa and Andrew’s beautiful home. The couple set out to renovate the house and convert its barn as sympathetically as possible to its 18th Century origins while adhering to modern energy conservation requirements. The contemporary space at the back of the house replaces an incongruous 1980s kitchen extension. The clever glass-box design by Paul Crosby of Crosby Granger Architects ensures that the room is not visible from the road, but gives views across the spectacular Kentmere Valley. The oil-fired heating system was removed and a new biomass pellet boiler was installed in the old barn byre, substantially reducing the home’s carbon footprint. The septic tank was disconnected and replaced with a modern Klargester Biodisc treatment plant, so clean water is now the house’s only output into the valley. A modern kitchen extension was demolished at the back of the house and replaced with a glass-walled room that reveals the original structure of the building. It was only when they lifted the carpets that the couple discovered many of the upstairs floorboards had been damaged or replaced with new boards. They saved as many of the originals as they could to reuse, but the floor in the Herdwick bedroom has been replaced with salvaged roofing timbers from a Lancashire cotton mill. In the old farmhouse, the living room fireplace has the original exposed brick surround. The coffee table is actually a pig bench bought from Lots Road Auctions. Once everything was structurally sound, Vanessa began decorating, starting with the master bedroom in the old house. She chose a sheep print fabric for the curtains, teamed with heritage soft-white paint on the old walls. The en suite has a quirky low-level window and they deliberately positioned the roll-top bath in front of it, and in view of the bedroom. Vanessa sourced furnishings and accessories from Ebay, Etsy and antiques shops, choosing items carefully to ensure they fit the home’s relaxed and lived-in look. A welcoming vibe is essential here, as when the family aren’t staying here for weekends or their own holidays, Vanessa manages the property as a holiday let. ‘We welcomed our first guests about nine months later than planned, as like all the best projects, our two-year renovation had its ups and downs and delays,’ says Vanessa.